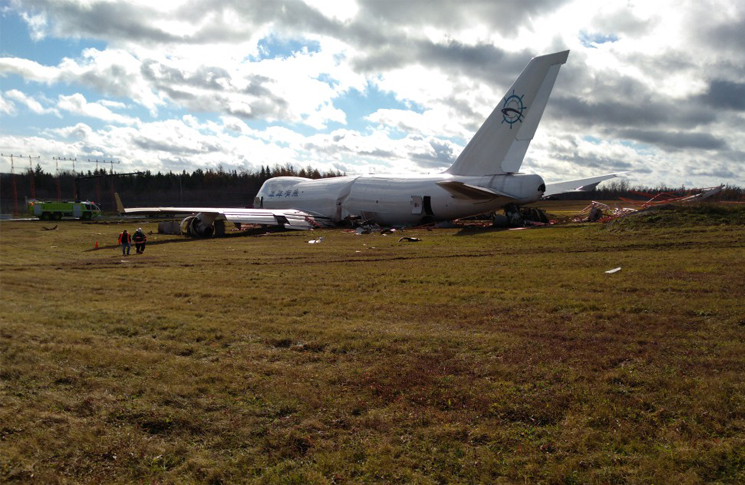 Description The cargo aircraft suffered a runway excursion after landing. After touching down the aircraft was unable to stop and finally stopped 210 metres (695 feet) past the end of the runway. It remained within the airport perimeter and sustained substantial damage. There was a post-impact fire in the tail section, caused by the number 2 engine separating from the wing. All occupants suffered minor injuries. Description While en route at an altitude of 150 m, on distance of 50 km from the airport of Arkhangelsk, the plane got into icing conditions. The pilots decided to return to the departure aerodrome. The aircraft then lost engine power and a forced landing was made in a forest. 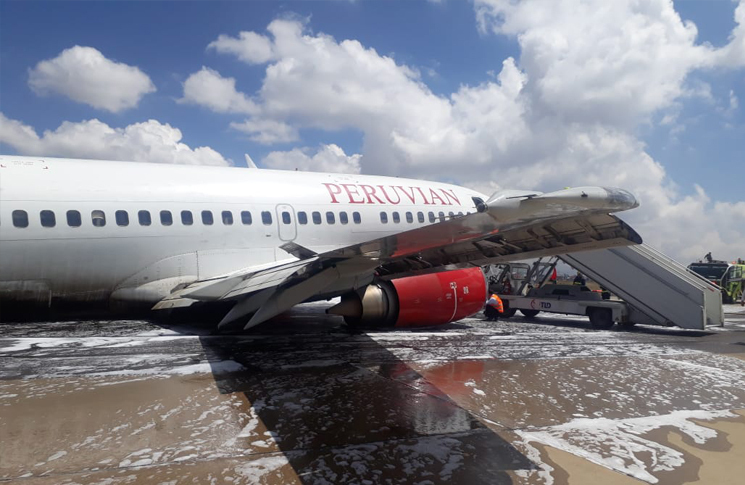 Description After take-off, the aircraft reported an issue with the hydraulic system. The climb was stopped before reaching FL200 and the aircraft turned back to Georgetown Airport but suffered a runway excursion on landing. It went off the runway and came to rest across the airport perimeter fence. The aircraft sustained substantial damage. The right-hand main landing gear had broken off, and the no.2 (right-hand) engine pivoted forward and upwards. Six people were injured, and one passenger died from her injuries one week later. Video footage of the site where a Fly Jamaica aircraft made an emergency landing earlier this morning. Fly Jamaica flight OJ256, which departed the Cheddi Jagan International Airport (CJIA) for Toronto, Canada, at 02:10hrs on Friday morning, declared an emergency landing 43 minutes into the flight.On board were 120 passengers and eight crew members (six Guyanese, two Jamaicans). There were 35 Guyanese, one Trinidadian, 82 Canadians, one Pakistani and 11 American citizens on board. 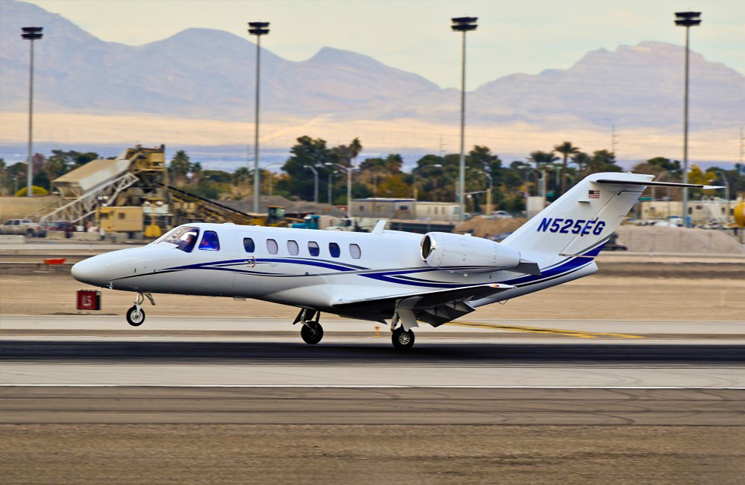 There were no broken bones or other serious injuries reported, however, six passengers suffered minors injuries due to the impact to the back of the aircraft. They were rushed to Diamond Diagnostic Hospital where they are currently resting comfortably. All of the baggage is secured and the aircraft’s hold was not breached. Description The aircraft suffered a landing accident when the main landing gear collapsed. It came to rest on the runway with the nose landing gear and both engines contacting the ground. Description The aircraft crashed during an attempted landing at a farm. On board were two passengers and two crew members. All four were killed. The farm has a single 1200 m long asphalt runway (02/20). Description The aircraft was destroyed when it impacted a wooded area. All three occupants were killed. According to preliminary information from radar data and air traffic controllers, the aircraft took off from Jeffersonville-Clark Regional Airport, Indiana, and was climbing through 6000 ft mean sea level when it began a left turn, descended, and disappeared from radar. The pilot had previously been given a frequency change, which was acknowledged, however the pilot never reported to the next controller and no distress message was heard on either frequency. Description The aircraft experienced a loss of directional control and subsequent runway excursion upon landing. The plane went off the right-hand side of the runway and sustained substantial damage. There were no reported injuries to the occupant(s) onboard.